Paint the outside of the foam cup and allow to dry. Cut simple ears and feet from scrapbook paper. Cut a triangle from pink paper for the nose. Cut a pipe cleaner it half for the legs and glue the feet to one of the ends. For the ears, cut another pipe cleaner in half and glue to the outer edge of the paper ears. Trim off excess leaving a small amount at the bottom to poke through the top of the cup. Place one of the ears on top of the cup. Use a toothpick to poke holes, using the ear as a guide. Remove toothpick and insert the ears into the holes. Repeat for the other ear and secure with glue. Glue the pink triangle to the front of the cup. Poke two holes in the top-front (near the rim) of the cup and insert the two pipe cleaner legs. Use the handle end of a paintbrush to dot on two eyes and draw eyebrows on with black marker. Bend the legs and sit your bunnies on a shelf. 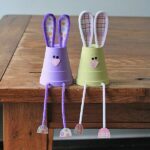 This project for Foam Cup Bunnies was printed from CraftsbyAmanda.com - https://craftsbyamanda.com/foam-cup-bunnies/ and can only be printed for education or personal use.